Spirits have appeared by the hundreds, attempting to influence the democratic process of electing the next president. At first, everyone thought is was just an advertising gimmick for the new Ghostbusters movie, as rumors spread of ghosts appearing across the country. But, scientists have now verified that the nomination of Donald Trump caused a rupture across time that brought spirits from history back to earth to warn of Armageddon. One of the first sights to be reported was that of the spirit of Prime Minister Neville Chamberlain, who hovered above a Senate Foreign Relations Committee meeting, urging that they never fall victims to Trump’s new Appeasement policy with Putin. 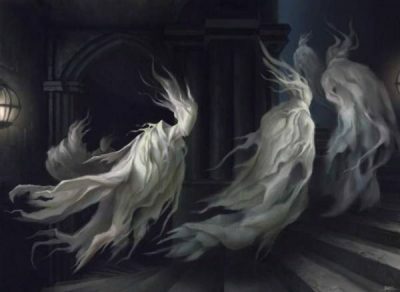 Thousands of spirits rose from their graves in Eastern Europe and filled the chamber, wringing their ghostly hands. Hundreds of people who happened to look up spotted the spirits of the Founding Fathers, swooping into the Democratic Party Convention, swaying above the crowds to Bridge Over Troubled Waters. The spirits of Daniel Webster, Abraham Lincoln and Martin Luther King reportedly entered the bodies of speech-makers there, to help raise the delegates to a fever pitch to do anything they could to stop Donald Trump, as an army of ghosts slimed “Bernie or Bust” rabble-rousers outside. Millions of spirits volunteered to create nightly nightmares for all registered Republican voters, walking them through the wasteland that will be the earth if Trump is allowed to put his finger on the red button. Frightened Trump supporters swamped Trump headquarters with calls and emails. Trump responded by quickly issuing this tweet: “I don’t take advice from the living or the dead.” Following the tweet, Trump was found unconscious in his bed, suffocating in a mass of slime. Campaigns End on Election Day. Revolutions Don’t.